RAM is a drum-roots-driven powerhouse band from Port-au-Prince, Haiti. Ancient folkloric polyrhythms intertwine harmoniously with Punk Rock guitar riffs and swinging Caribbean keyboard melodies, led by the entrancing singer, Lunise, all combine for a truly magical experience on Thursdays at Hotel Oloffson in Port-au-Prince, Haiti – where RAM has consistently gigged for the last 25 years. The band derives its name from the initials of its founder, songwriter, and lead male vocalist, Richard A. Morse. The band’s music has been described by Morse as “Vodou rock ‘n’ roots”, and has been one of the prominent bands in the mizik rasin musical movement in Haiti. RAM began performing together in 1990, and recorded their first album in 1996. 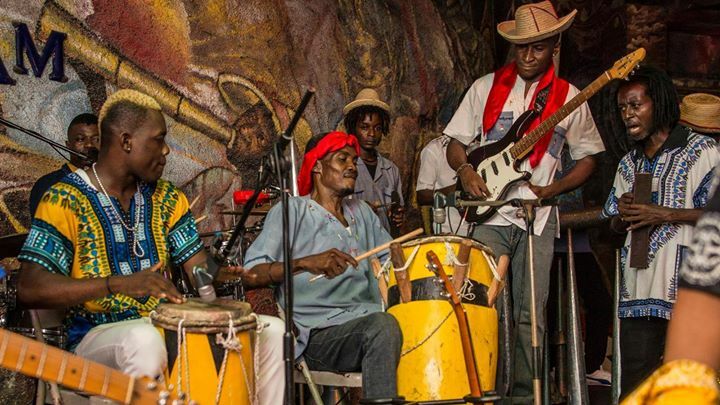 The band’s music incorporates traditional Vodou lyrics and instruments, such as rara horns and petro drums, into modern rock and roll. The band’s songs include lyrics in Haitian Creole, French, and English.